Raid is the first film of superstar Ajay Devgn in 2018. Read its in depth review only on BollywoodMDB before booking your tickets. 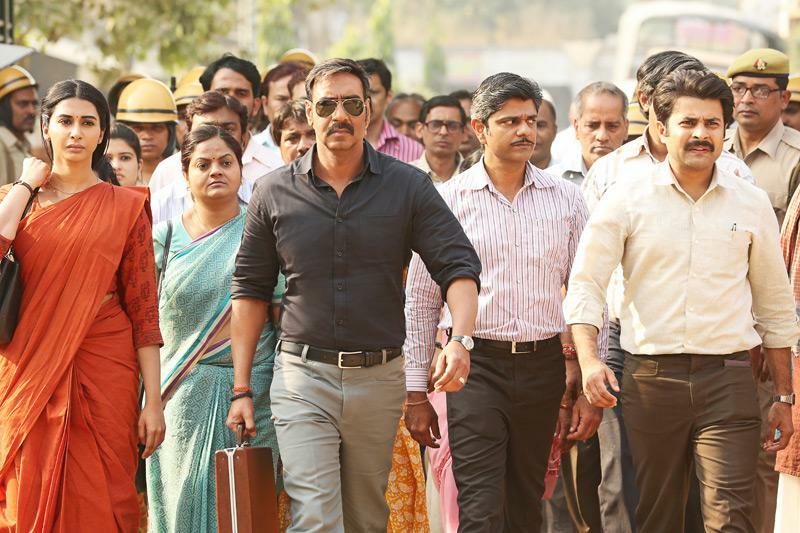 Raid is inspired from some real-life incidents which led to one of the most high-profile Income Tax raids in India. Amay Patnaik (Ajay Devgn) is an honest Income Tax Officer who loves his wife Malini (Ileana D'Cruz) unconditionally. But more than his wife, he loves his job and all the responsibilities which come attached with it. Amay can go to any extent when it comes to nabbing the collar of those powerful people who have stashed loads of black money. The brave and fearless IT officer carries out a non-stop raid at the sprawling bungalow of Rameshwar Singh (Saurabh Shukla), one of the most powerful and corrupt politicians of UP politics. But bringing Tauji, as Rameshwar is called by all, to the book is not an easy task. He is well-connected and has his own army that is ready to take the law in hand and die for him. Will Tauji manage to stop the raid or will Amay create record for doing the longest raid of Indian history? Ajay Devgn is an actor who is getting better and better with each one of his film. In his last release Golmaal Again, he enthralled us with his unrivalled comic timing. Here, he wins our heart with his intense look and amazing action skills. There is no doubt that he is the backbone of Raid. After watching him in the character of Amay, it becomes almost impossible to imagine any other actor in the role. The role suits him wholly. Besides Devgn, the movie has another powerful performer who puts in his everything to perfect his part. We are talking about veteran actor Saurabh Shukla who plays Tauji with panache. He is outstanding in the film. Raid would not have been the same film without him. Ileana D'Cruz as Shalini is okay. The actress doesn't get much to do in the film. However, she tries to leave a mark in whatever she gets to perform. After directing Ghanchakkar in 2013, filmmaker Raj Kumar Gupta is making a film after a huge gap of 5 years. Though his last directorial was not a box office success, no one can argue that he is a brilliant filmmaker who has given us hard-hitting films like No One Killed Jessica and Aamir. His latest offering is also a special film for a series of reasons. This is the first time when someone has attempted to make a movie on IT raid. The movie brings Gupta and Devgn together for the first time. It is powered by a strong story and impeccable performances by Ajay Devgn and Saurabh Shukla. Raj Kumar Gupta has spent a lot of time on the characterization of his actors along with paying keen attention to details while creating the era of the 80s. His story is intense and dialogues remind you of the time when they used to play pivotal roles in making or breaking a film. Camerawork in Raid is good, but the background score is just amazing. It hightenes the thrill as you bite your nails to know what is going to happen next. Talking about editing, it is excessively casual at points. The film scores well in other departments though. Tanishk Bagchi has very beautifully recreated two songs – “Sanu Ek Pal Chain” and “Nit Khair Manga” - of legendary singer, Nusrat Fateh Ali Khan in Raid. Both recreated versions have been sung by Rahat Fateh Ali Khan and are too melodious to ignore. The album of Raid is going to benefit a lot from the fact that both the songs emerge from two old classic songs. Amit Trivedi’s compositions “Jhuk Na Paunga” and “Black” are good but had a scope to become even better. Watch Raid for extraordinary performances by superstar Ajay Devgn and immensely talented Saurabh Shukla. It is an expertly helmed engaging drama that you should not mind spending your money on. Luv Ranjan’s next reunites Tabu with Jimmy Sheirgill after 22 long years! October Review: An amazingly crafted movie where Varun Dhawan gives his all! Bhushan Kumar hits the jackpot with multiple successes in the first quarter of 2018!